This is the story of a dirty little problem, a cancer and a plague that is just starting to slowly eat away at the heart of the Friendly City. 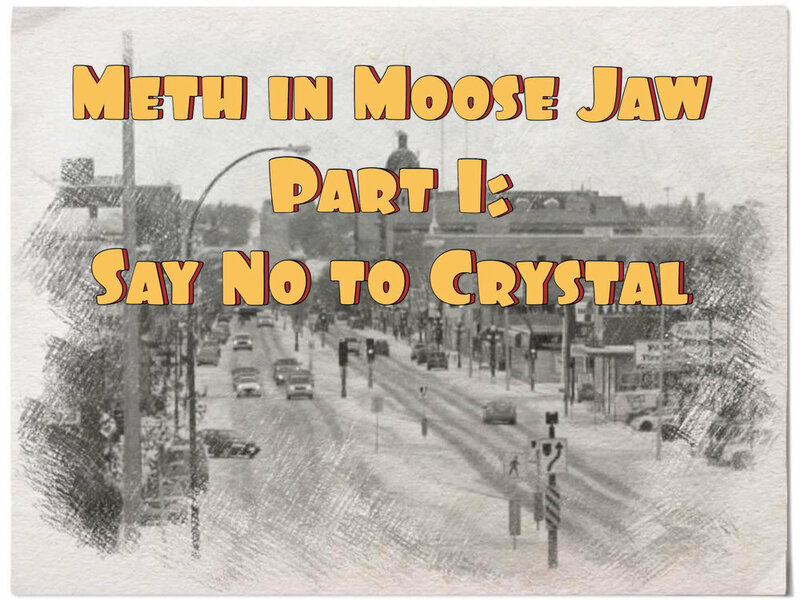 This is a story about Moose Jaw; and this is a story about Crystal Meth. Crystal methamphetamine, or just plain old Meth, was invented in 1919, by a Japanese chemist, “perfecting” an earlier German chemist's discovery. 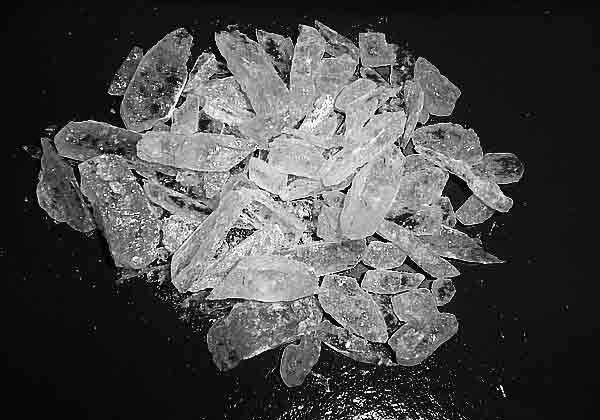 Believe it or not, Meth, like so many other technological discoveries, was seen as a “breakthrough"; as a weapon of war. Something in the general’s toolboxes designed to help kill. In World War II, Meth was issued to German shock troops, as it enhanced their fanaticism; and Japanese kamikaze pilots were dispensed the drug just as they flew off on their suicide missions. Allied troops also gobbled it up. Hell, even Hitler had himself a little meth addiction. But what does this have to do with Moose Jaw? Well, I am sorry to tell you, but Meth is already here. It's starting to show it's ugly head. And, sadly to say, sometimes with violence. If any authority in Moose Jaw were to say that Meth has so had no effect on crime, they would either be ignorant of the facts, sanitizing reality with PR skills or just plain outright lying. I can tell you right now, with the utmost confidence, that meth has indeed played a factor in the rising of local crime rates; and, on multiple occasions, in some shockingly violent ways. There has been at least one vicious stabbing, as well as a couple of other violent crimes, such as robbery, where meth has been involved. I am not writing this series of columns to provide excuses for the people committing these crimes, to give them relief from what the courts ultimately decide to do with them. Drug abuse and addiction might be mitigating factors, but really, I don't believe they are excuses that should warrant leniency when facing justice. But just imagine being a cashier, a clerk or a bank teller; you're doing your job and someone comes to rob you and they are high on meth. It goes far beyond unnerving. It's enough to break the spirits of the strongest employee. You don't have to be a user to see your life changed forever by Meth. Sadly, it's already happened right here in Moose Jaw. I write this, because we need to face the facts. And facts can often be dark and ugly. No secret meeting will ever cover this one up. I spoke to someone living in a less economically affluent Moose Jaw neighbourhood and I can tell you that crystal meth is affecting the very character of that neighbourhood. “We've got three Meth houses and a Crack house all within a block,” I was told, when I asked them why they needed such a tall fence and such a seemingly vicious, barking dog. Meth has changed these innocent residents lives, and obviously not for the better. These innocent residents need help; and that help is either not coming or just dreadfully slow in arriving. Meth is a slow, heartless killer, it is a cruel and unreasonable killer. It isn't like Fentanyl and opioids, where overdoses are headline news. By the time most headlines begin with Meth, it's already seeped it's way into the fabric of a city. The Saskatoon Police Service (SPS) released statistics of violent crime. SPS said the "use of force" incidents by officers have increased, due largely to meth and meth-related crimes. In 2015, force, when confronting suspects, had to be used 92 times. That number nearly doubled in 2016, to 176. The trend continues to grow. Although they won't confirm it, due to privacy rules and regulations, it's easy to see, from Moose Jaw court cases, our First Responders (police, firefighters and ambulance personnel) have already faced this. They've had to deal with offenders driven by Meth. It has got to be unnerving to say the least. Meth doesn't release its grip easily. Many people need to hit rock bottom to kick meth addiction, and sometimes, when you get that low, there's just no coming back. These people need to understand, first hand, how badly they need to quit destroying their lives. Meth is a cancer that will not just rot the heart of a human being, it will rot the soul of a city, as well. From speaking to members of the Moose Jaw Police Services, meth distribution and abuse enters the friendly city in waves. Someone brings in a bunch, it shows it's ugly head and then, when the supply runs out, it all dies down, people, unable to access it, struggle with their addictions in silence. The problem is that the shipments seem to be showing up with ever-increasing frequency, making that lull between shipments less and less extensive and, far too often, making meth too easy to find. The effects of Meth, and other “hard” drugs, keep showing up time and again in the daily police reports. So really, how prevalent is meth in Moose Jaw? Well, the best I could find out, using various sources, is that it's not yet an overwhelming problem, but I can tell you it's not in it's infancy either. It's growing rapidly, and although not confirmed, the 2018 budget request from MJPS points to increased violent crime in 2015 and 2016. Although I cannot prove it with scientific evidence and a bevy documents, I do know the violent altercation statistics coincide directly with the rising use of meth in Moose Jaw. Meth in Moose Jaw is more like a cantankerous toddler, just finding it's legs and throwing tantrums, which might create an embarrassing scene for parents if it happens in a store or a restaurant, but when Meth throws a tantrum it destroys lives and communities. The thing with Meth, though, is that it's life cycle is rapid, and the jump from cantankerous toddler to rebellious teenager can happen almost over night. To simply dismiss meth as only a problem for the poor, the weak and the foolish who would willingly take it, might seem a great strategy for many, but the problem with that logic is that meth has has gotten beyond it. Meth effects our children. It is highly addictive. It's said that just using it once can make you an addict for life. It's a fact that some drug dealers use meth to create a loyal clientele. It keeps young customers coming back. They cut the narcotics they sell with Meth and create addicts or customers that, driven by addiction, must return. There were reports, in 2006, of cocaine cut with meth being seized in Regina, Weyburn and Estevan. The dealers using the cut cocaine were able to build a steady supply of repeat customers, thanks to the ruthlessly addictive qualities of their product. I also discovered a Moose Jaw case where one resident bought marijuana, smoked it, and unwittingly used meth. It is all right there, written in official court documents. If you truly think most drug dealers run ethical and clean operations, you are kidding yourself. Drug dealing is about making a quick and easy buck, and it most certainly does not give back to addictions counselling in the community. As mentioned on more than one occasion, by Moose Jaw Police Chief Rick Bourassa, we need a strategy when it comes to illicit drugs. Arresting everyone makes a dent but there always seems to be someone out there to fill the void. It's like an automatic washer stuck in a continual rinse cycle, filling, spinning and re-filling forever until you unplug it. This series of columns will feature a street level view of meth in Moose Jaw. They represent 14 months of hard work. We've come to the conclusion that there needs to be something done at a family, local, provincial and federal level; something more than continual debate and discussion. There needs to be action. The real problem is when? An edited version of this column initially appeared in the Moose Jaw Times – Herald. The column has been updated and sections originally removed in editing restored to it.